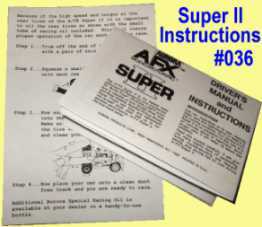 We now have Super II Complete instructions available! Complete exact manual (reduced size) with oiling directions (actual size). 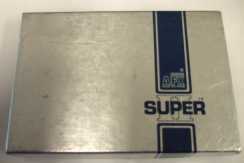 The Super II was made by Aurora in 1972 and was developed as a result of competition with Tyco. A young 17 year old, Tony Porcelli, originally made the 1st car for himself to compete in races and beat the hot Tyco Pro cars. Aurora was so impressed with the lad, they offered him a job and used his car as a design basis for the Super II. 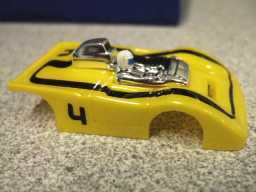 The cars came from the factory to be a full-race slot car with every conceivable trick known. Quadralams, were the fastest known armature and each car came with one, and they supposedly could turn 68,000 RPMs! Everything was gold plated for superior electrical input. It was just the ultimate...unfortunately they didn't perform to their racing expectations. Most racers were disappointed and especially after shelling out some $12 each, which at that time was a lot of money compared to regular AFXs for $4. Super IIs were then usually dismembered for their parts or just simply put away from disappointment. Can you tell me how to identify a Super II? 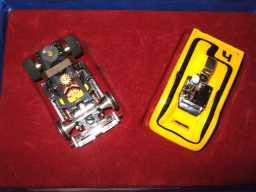 1.All base chassis are black plastic with gold plating and the armature brush springs mount inside gold cups. It also has special slots behind the front wheels (under front gear plate tab locks) to accomodate the side weight's wire frame. 2.The top gear plate is very important for accuracy because they are no longer available, but they are also black plastic and have 2 small tabs that stand up at the rear of the plate. These tabs were designed to hold the lexan body off of the gears. 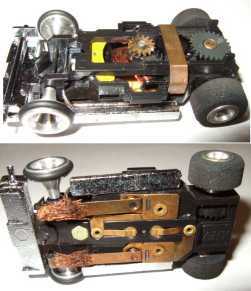 3.The top armature gear is plated instead of ordinary brass (later models came with std. brass). 4.The top idler gear (center) is also black plastic. 5.The motor magnets will be blue and yellow. 6.The pickup shoes will be gold with braided copper in the pickup area. 8.Rear wheels are aluminum attached to axle with set screws. Tires are foam. 9. Armature is a quadralam. This is a copper double-wire wound armature--there are actually 2 wires going in and out of each commutator solder joint on the arm. AFX and Tjet have 1 wire. The term quadralam is for 4 (quad) arm plates. If you look on the side of the arm plates there will be actually 4 definite thin plates. AFX and Tjets have 2 thick ones. The armature plates will be black also. For accuracy, there should not be any "balancing" cuts on the arm plates as another aftermarket company (K&K?) sold "balanced quadralams" that have small cutting marks in the side of the plates. Note: Xlerators also had quadralams but had much more wire windings and had a special no-removable gear made into the center shaft that requires a special Xlerator top gearplate. 10. The front wheels will have a deep conical shape and be machined aluminum with O-ring tires. The front axle is non-independent, made of small diameter steel. 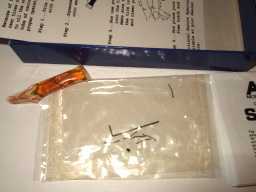 11.Guide pin will be double-sided AFX blade/pin molded also black. 12.Chassis will have side weights connected together by a wire that clips over the side mounting tabs. 13.A front weight is attached to a metal frame that doubles as the body mounting frame holder too. This metal frame is attached with an 0-80 screw and nut thru the chassis. 14.Body is lexan painted underneath in bright orange-red or yellow. There is a chrome plated cockpit/scoop mounted on the top side. Driver head is AFX style. Body is mounted to front of chassis by 2 small mounting pins. 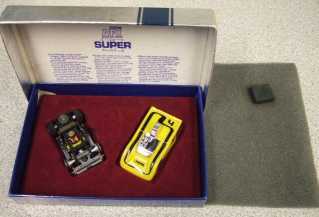 15.The car came in a special rear hinged cardboard box with a special velour-like vacuum-formed holder to display the chassis and body separately. 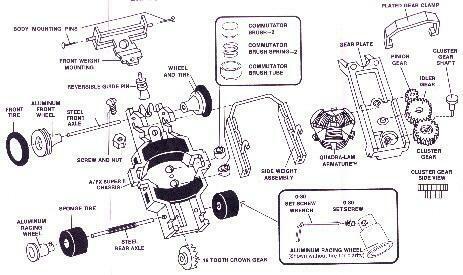 Underneath are instructions, tube of special oil, wheel wrench, body mounting pins, and tire oiling instructions. Are Super II parts still available? Yes, they are available, though supplies are depleting quickly. The infamous quadralam has not been available for some time, nor has the top gearplate making these 2 items the most sought after. Almost all other parts are still readily available thru your hobby store. The magnets, still very popular with racers. Were you really supposed to "oil" the tires? Yes. A small amount of oil was to be rubbed into the rear tires every time the car was raced to ensure proper operation. As a racing hint, a film of oil on the outside of your tires WILL improve your car's handling in the curves. See our new reproduction Super II instructions now available (top of page). Are there any books with photos of Super II cars? Yes. The Aurora HO SLOT CAR IDENTIFICATION and PRICE GUIDE by John A. Clark shows only 1 photo of the car but also has great color photos of all the Aurora/AFX car line and is great for identifying the Aurora cars. I hope this helps with your Aurora SUPER 2 questions and if you need to find parts for restoring your cars, see Road Race Replicas for all your needs. The above information is believed to be accurate, true and based on the opinions and experiences of Phil Pignon.